I've been crazy busy these past few weeks. I've had so much work to do. Now, that midterms are finally over I can finally dedicate some time to blogging. I'm excited to get back into the swing of things. The biggest thing to happen in the last month has been getting a little! In BBYO, we have big/little. A big is someone who's older and a little is someone who's a new member. It's one of the most exciting parts of BBYO. Big/little is similar to big/little in sororities. We have bonding time, texts, reveal, and lots of gifts. I was super lucky to get two adorable littles! I'm so stoked for them to go on their BBYO journey. They're going to love BBYO with all their hearts. I made them each a poster with all their favorite candy on it. They turned out amazing and both of them were obsessed with the poster. My sister actually wrote the posters, since her handwriting is so much prettier than mine. I made sure to take a ton of pictures with my littles on the night of reveal for each of us to have a keepsake from the night. I really loved how the frames turned out. I chose purple because it's Atlanta Council's color. I'm seriously in love with this t-shirt. I wanted to go to Walmart to find their whacky t-shirts for us to match, but the Walmart near me doesn't sell wacky t shirts. :( I ended up finding these on Amazon, so they we're a little more expensive. I didn't get a picture of giant containers I got them. They can keep BBYO memorabilia and t-shirts in the buckets. We decorated the containers with some markers I found. 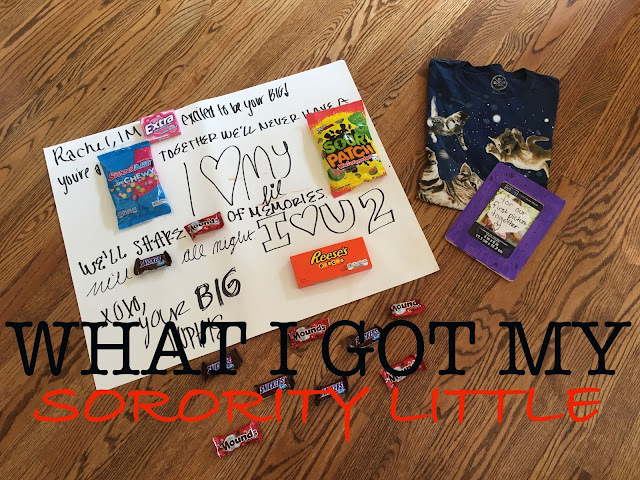 I'm so happy with how big/little reveal turned out. I definitely have the cutest littles. I'm so excited for them to completely fall in love with BBYO.